According to famous authors (f.e. Mark Twain) the RIGI is the "Queen of Mountains" because of her spectacular views to the surrounding lakes, glaciers and historic sites. 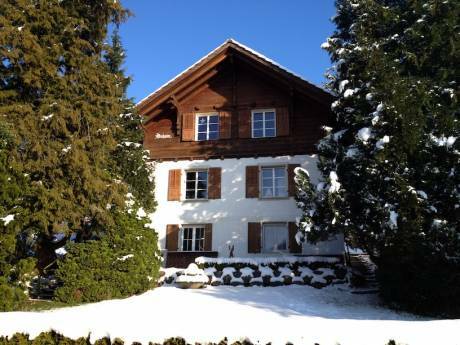 In Vitznau, just at the foot of the Rigi and at the beautiful Lake Lucerne (VierwaldstÃ¤ttersee) we found an ideal penthouse, which offers us comfort, fantatic views (from sunrise to sunset) and 3min walking access to the first cog-wheel railway (to the top of the mountain) or the oldest working steamboat (ferry to Lucerne, both every 60min) or directly to the Lake for swimming or kayaking (water temperature in summer is 22C). The penthouse with 160 sqm floor space was constructed in 2003 and covers the entire building (7 parties). The access from the double garage is by direct-lift. The concept is to combine the openness of a loft with the certain privacy of separated rooms. All areas have broad sliding doors which open to a large terrace (25m long) facing the lake and the mountains behind. There are windows to the meadow on the backside of the house, too. All rooms have floor-heating under white tiles. The decoration is of minimal art. 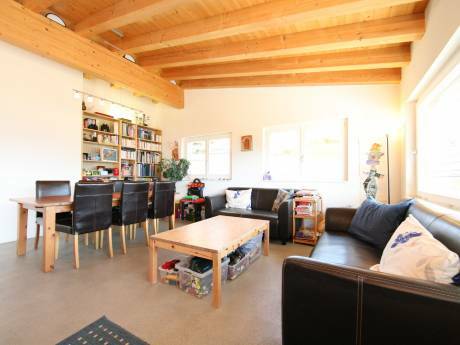 Kitchen, dining and living areas as well as the vestibule form the loft part. The rooms are: 1 large bedroom with bath, 1 smaller bedroom with folding bed/sofa, 1 bathroom, 1 guest WC and 1 office with hammock, which is the ideal place for a nice nap/siesta (or on the terrace). We are 3, me Ebs (65, retired), a former businessman, my wife Ulrike (60, housewife) and our daughter Carina (22,working in Germany). Despite our age we consider us as still creative, curious, sportive and adventurous - always open to meet interesting people. 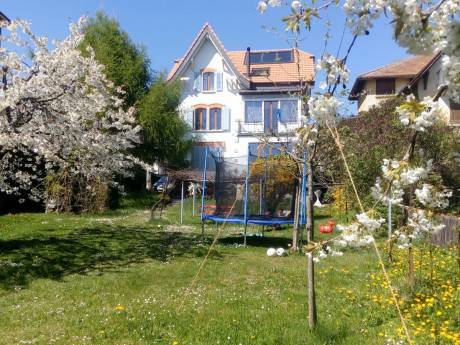 The penthouse is situated in the quiet and small village of Vitznau with no through traffic. The many tourists (mainly Americans and Asian) arrive by steamboat from the nearby Lucerne (Luzern), famous for its high-class tourism, dining and shopping as well as for its medieval character (world known are the painted wooden bridges). Be aware, it is also an expensive place! It is understood that in Switzerland everybody speaks English plus an additional language. Shops, restaurants and hotels are in a walking ( max.5min)distance around the home. The Park Hotel, ranked as the 6th best Swiss hotel, is just our neighbour. From the house you can start directly your favourite sports like hiking, biking,swimming etc. For Skiing (winter only), climbing or paragliding just take the train up. Or you can do nothing enjoying the nature - this, for sure, you will love most at this place, I bet.